Fighting has gone on for nearly 17 years, with U.S. troops in Afghanistan seven years longer than the Soviets were. The U.S. leadership claims to have a strategy for victory even as warm weather brings in yet another “fighting season” and new rounds of deadly violence in Kabul. Sixteen years and seven months of violence, loss, sacrifice and significant investment, without victory, is alarming – but is it without hope? As a scholar of Afghanistan and strategy and a soldier who has served four tours in the country, I’d like to explore both the apparent stalemate and the reasons for harboring hope of an eventual resolution. The two sides see gains and losses each year, until colder weather diminishes their ability to fight until the following spring. As the weather warms up, the pattern repeats itself. This story is told by 10 years of U.S. Department of Defense reports on Afghanistan that are required every six months by Congress. Of course, it’s impossible to identify simple reasons for the failure to win something as complex as a war. Early on, the coalition and its Afghan partners lacked a strategy and a willingness to help rebuild the country after decades of war among Afghans, Russians, the Mujihadeen – and ultimately the Taliban – made Afghanistan one of the most damaged and destitute countries on the planet. The Bush administration reviled the notion of nation-building, focusing instead on targeting individuals for killing and capturing. For the first several years, the U.S. relied too heavily on warlords, tolerated venal Afghan leadership and employed air power indiscriminately, thus inadvertently killing civilians. All of this aggrieved many Afghans. Still, none of those missteps were decisive. Rather, I would argue that the war has dragged on for one overarching reason – Pakistan’s support for the Taliban. The proof is in years of those Department of Defense reports. The November 2013 report stated that Pakistan provides physical sanctuary to the Taliban leadership and that sanctuary is “a major factor preventing their decisive defeat.” It reported, Taliban “insurgents that attack Coalition forces continue to operate from Pakistan.” What’s more, most of the materials required to sustain the conflict, and “emanating from Pakistan,” remained significant. Nothing had changed three years later when, at the end of 2016, yet another report noted that the Taliban – including the senior leadership of the lethal Haqqani clan that excels at high-profile terrorist attacks – had retained sanctuary inside Pakistan. Of course, Pakistan’s security establishment consistently and eloquently denies all this. A corollary explanation for the stalemate is America’s tendency to focus on strikes and operations without necessarily linking those operations to the ultimate desired outcome: peace and stability. This was the case 30 years ago when the U.S. was supporting the Mujahideen during the Soviet-Afghan War, and it was the case with Rumsfeld’s Pentagon from the beginning years of the war in Afghanistan. After the ill-conceived invasion of Iraq, Afghanistan turned into a secondary and underresourced effort for the U.S. with a limited number of special operations and conventional forces conducting strikes and raids to kill or capture key leaders. There was a dearth of troops and resources committed to address the challenge of stabilizing the country. The biannual defense department reports tell this story too. They tend to quantify the number of tactical actions – rather than assessing their effectiveness. While strikes that kill or capture enemy leaders do disrupt and damage the Taliban, their effects are fleeting, not decisive. They do not bring strategic momentum. However, with the change in policy last August, there is cause for hope. 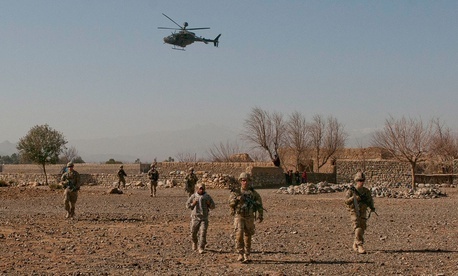 The stated policy of the current administration is to win in Afghanistan. This contrasts to the previous policy, which was simply not to lose. But what would winning look like? A win, according to a definition worked out during my tours as an adviser to senior military leaders, would be a durable Afghan state, with the government, the security forces and the population aligned against a marginalized Taliban. Another reason for hope is that this new strategy is based on conditions on the ground being met, not arbitrary timelines. The strategy calls for an increase of about 3,500 U.S. forces – to a total of over 14,000 – to advise and assist the Afghan security forces. NATO countries are also contributing additional troops, bringing the total number of Coalition troops in Afghanistan to more than 21,000. This modest increase in troops isn’t enough to break the strategic stalemate. However, it will support growing the Afghan Special Security Forces, building the capacity of the Afghan Air Force and improving the other security forces by employing more advisers with tactical units that do the fighting. That should allow the Afghan security forces to win more battles against the Taliban and gather marked operational momentum that will complement efforts to alter Pakistan’s harmful strategic proclivities. Perhaps most notably, the new strategy avows that “we must see fundamental changes in the way Pakistan deals with terrorist safe-havens in its territory” for the strategy to gain momentum. Of course, just stating that there is a new strategy does not necessarily mean the strategy is working. In mid-January 2018, America’s U.N. ambassador, Nikki Haley, stated that Afghanistan peace talks are closer than ever before. Days later, the Haqqani network attacked the Kabul Intercontinental Hotel, killing at least 30 people. Less than a week later, the Haqqani network murdered more than 100 people by detonating an explosive-laden ambulance in a crowded section of Kabul. Two more complex suicide attacks followed in April. And in early May, Islamist militants attacked a voter registration site in Khost Province, killing over 17 and wounding more than 30. Khost is next to the Haqqani sanctuary in Pakistan. Since 9/11, the United States has explicitly stipulated that Pakistan must cease support to extremist and terrorist groups. Diplomacy and US$33 billion in aid since 2002 have not brought a change in Pakistan’s conduct. Some have suggested that withholding aid from Pakistan is a step in the right direction. Withholding funds is not nearly good enough to compel accountability, nor to punish Pakistan for years of odious actions. Pakistan has not stopped its support of terrorists and insurgents in Afghanistan in any fundamental way. It is time to consider responding with punitive, lethal measures aimed at institutions in Pakistan that directly advise and fund the Taliban and the Haqqani network. Some may wonder why it’s necessary to persist in this war – and not just bring the U.S. involvement in it to an end. Practically speaking, Afghanistan represents an excellent base for combating Islamist terrorists in that region of the world. But there is also an ethical argument for seeing the war through to a successful end. Afghanistan has been the good war of the post-9/11 wars. The United States went to war there for the right reasons – defeating al-Qaida, the perpetrators of the 9/11 attacks, and removing the Taliban regime that provided sanctuary to al-Qaida. Although imperfectly carried out, the coalition also attempted to fight a just war by avoiding the killing of civilians. It would be fair to argue that it is a moral imperative that the U.S. not quit on a commitment to its Afghan allies in a war against externally directed murderous Islamists.